What is School and Education Campus Safety Program? First Aid to Save a Life (FATSAL) Pakistan is pleased to announce their new training program, School and Education Campus Safety Program, to serve our education sector to take pride in managing their schools, colleges, campuses more safely and claiming to have better controls in place to prevent accidents in their premises and better equipped to control if the undesired situations arise. Let us answer some of the most common questions first to help you understand this initiative and how you can benefit from it. With this they has committed to improving their level of preparedness and if they are enlighten with this vision then First Aid to Safe a Life (FATSAL) Pakistan is the only organization in Pakistan who can take them along to achieve this goal. 3) Encourage Schools, Colleges & Education Campuses to help their students learn basics of emergency preparedness. Answer: This program does more than provide useful emergency preparedness information. Our training will help you to understand basics of emergency preparedness and approach to identify hazards and take effective and measurable steps to control all risk factors. Additionally, we can provide a number of services to enhance emergency preparedness efforts and support you to maintain compliance over a period of time through continuous and surprise checks. Can anyone become a member of the program? Answer: Any school, campus or organization who is committed to improving their emergency preparedness is welcomed and encouraged to join this program. Answer: We are experienced to address the important components of preparedness so you can have better control over hidden hazards and manage them efficiently if the need arise. Our program not only provides members with helpful information – it also recognizes members for their efforts. Why is there a need for this program now? Answer: Pakistan lack a mindset in safety and if it is true then schools are the best place to go and correct what went wrong and encourage our coming generation to plan ahead and prepare to prevent and if not possible to avoid it then put in place some plans to mitigate. lack a mindset in safety. We can’t let adversity knock on the door to learn what we failed to have plans in place or skilled staff to manage this incident efficiently to avoid losses to human, environment, assets and repute of organization! Can we? The injury and/or loss of life of a child is unbearable pain that parents had to go through. So we have to BE READY to deal with emergencies as they can happen at any time, so there is a constant need to prepare for emergencies. 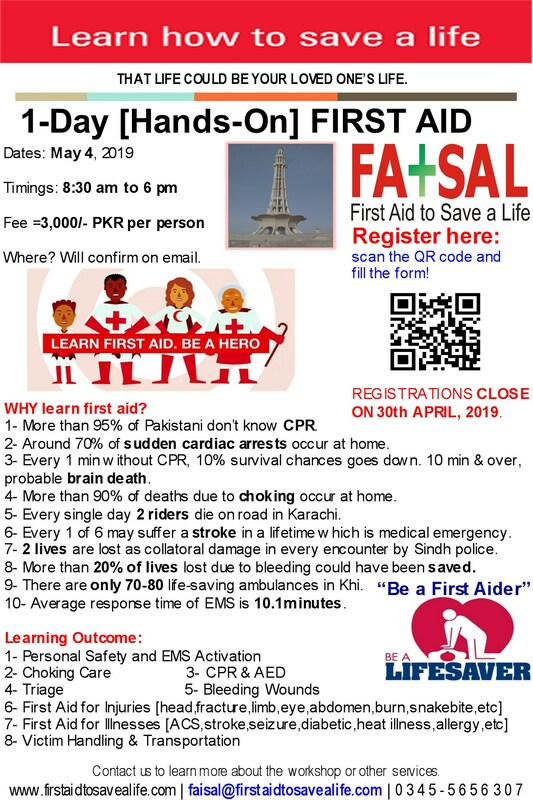 In the meantime, you can always use our email faisal@firstaidtosavealife.com if you queries or call +92 345 5656307 / 0333 5103798 to find out more about our training and consultancy services or getting the equipment you need. This entry was posted in School & Education Campus Safety and tagged are you save at your campus, are you save at your college, are you save at your school, are you save at your university, can you say or claim that your campus is safe, can you say or claim that your school is safe, do you feel safe and secure in your campus, do you feel safe and secure in your college, do you feel safe and secure in your school, do you feel safe and secure in your university, education campus safety program, how colleges should take care of their students in case of emergency, how education campus should take care of their students in case of emergency, how schools should take care of their students in case of emergency, how we can develop a system to rank schools with respect to their safety and security arrangements, how we can work on to build a system in pakistan to rate schools on their safety and security arrangements, is there any mechanism in pakistan to rate school's safety, is your campus safe?, is your school building safe, is your university safe?, safe schools, school and education campus safety program, school safety program, schoold and education campus security program, schoold and education campus training program, what does you want to see in any school to say that it is safe for your children, what does you want to see in colleges to say that it is safe for your children, what does you want to see in your school to say that it is safe for your children, what gurantee that your campus is safe, what gurantee that your school is safe, what is basic requirements. Bookmark the permalink. 2 Responses to What is School and Education Campus Safety Program?